In my work as a presbytery stated clerk, I am called upon to help equip ruling elders-elect for their service on the session and in the wider church. As a ruling elder myself, I recognize the need for polity education for those of us who are not seminary-trained church leaders. 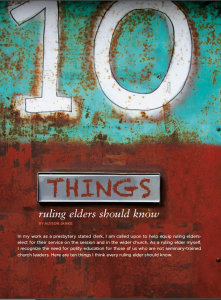 Here are 10 things I think every ruling elder should know. ►1. God called you to this service. Sometimes we think of serving on the session of our churches as “taking our turn on the board.” Although we responded to a nominating committee’s invitation, God was behind it. Being a ruling elder is a ministry to which we are ordained. Ruling elders (and deacons) answer the same questions at ordination as teaching elders (ministers) answer, except those questions specifically related to the duties of the ministry. Ordination is for life, even though terms on the session are limited. When a ruling elder is not serving on the session, he or she is still eligible to perform many of the functions of the ministry, such as being the clerk, assisting in the administration of the sacraments or being a commissioner to one of the more inclusive councils. ►2. We are presbyterian, not congregational or episcopal. Congregational types of churches make decisions in congregational meetings. Episcopal types of churches authorize their bishops to make decisions for the life of the church. Presbyterians come together in groups elected by the people they serve to make decisions. These elected people are called presbyters, ruling elders and teaching elders (also called ministers of the Word and Sacrament). Very few decisions are made by single individuals and very few decisions are made by vote of a congregation. Most decisions for the life of a congregation are made by the session. These range from providing for the worship, education and spiritual nurture of people in the congregation to managing the physical property of the church and adopting a budget. ►3. There are four councils, or governing levels, in the Presbyterian Church (U.S.A.). The session is the council of the congregation. The congregation elects the persons who serve on its session. There is a moderator or co-moderators and the ruling elders elected for specific terms. The presbytery is all the congregations and teaching elders within a certain district (G-3.0301). The synod is a specific geographic area with at least three presbyteries (G-3.0401). The General Assembly is the council of the whole church (G-3.0501). When presbyteries, synods or the General Assembly meet as deliberative bodies they are composed of commissioners who are ruling elders and teaching elders in numbers as nearly equal as possible. ►4. Presbyters are commissioners, not delegates. Whether we are serving on our congregation’s session or as a commissioner to presbytery, synod, or General Assembly, we seek to “find and represent the will of Christ,” (F-3.0204) not those who elected us. While their opinions and positions inform us, they do not bind us. When we gather together we pray for the guidance of the Holy Spirit, listen to discussion and debate and vote as we are led by the Spirit. We bear in mind that Christ is the head of the church (F-1.02) and all of the business we conduct should be done in a way that builds up the body of Christ. ►6. “Ruling” in the title of ruling elders is about measuring, not flexing power (G-2.0301). It is their role to measure the spiritual health of the congregation entrusted to their care and make decisions that equip and strengthen the congregation’s discipleship. Ruling elders follow the example of Christ and lead by service while working with moderators of session and pastors. ►7. Compassion is one of the characteristics of ruling elders. In many Presbyterian churches there are deacons who carry out ministries of compassion, witness and service (G-2.0201). In the Presbyterian churches that have chosen not to have deacons, “the function of this ordered ministry shall be the responsibility of the ruling elders and the session” (G-2.0202). In either case, part of the role of the session is to be a compassionate witness in the congregation and community. ►8. We sometimes disagree. Occasionally people on church councils avoid disagreement in order to be “nice” or more “Christian.” As far back as 1788, Presbyterians recognized that “there are truths and forms with respect to which men (people) of good character and principles may differ” and that we then need to exercise “mutual forbearance” (F-3.0105). Disagreement is not a bad thing when it is expressed in ways that do not disturb the “peace, unity, and purity of the church” (W-4.4003g). ►9. We are a constitutional church. Presbyterians believe that our life together is best when lived with “a disciplined concern for order …” (F-2.08). Our constitution is more than a set of rules. Part 1 of the Constitution is the Book of Confessions, consisting of 12 documents whose origins span 1,800 years of church history. Part 2 of the constitution is the Book of Order with four sections describing the way we order our life together. It is important to remember that part 1 is the Book of Confessions, reminding us that the foundation of our polity is what we believe. Our specifications of order grow out of that foundation. Even the Book of Order begins with a three-chapter synopsis of what we believe (called The Foundations of Presbyterian Polity) before it launches into the other three sections: The Form of Government, The Directory for Worship and The Rules of Discipline. These living documents are changed by a specified method as often as every two years. ►10. We are a connectional church. Each congregation is part of a web of relationships in our Presbyterian family. In part, this means that each congregation and each session is accountable to the larger church through the presbytery. This accountability is expressed in requirements for annual reporting and review of session records. Presbyteries and synods are likewise accountable to the council above. We’re all in this together. The decisions of one council influence the work of another. Persons ordained by one presbytery or session are ordained in the whole church. We support and pray for each other. Those elected as ruling elders to serve on their sessions may also be called upon to serve as commissioners to presbytery, synod, or General Assembly. Understanding these basic principles of Presbyterian polity can help us to be more comfortable in our roles as ruling elders and to serve and lead more effectively. ALYSON JANKE is a ruling elder with varied experience in using and interpreting Presbyterian polity, including 20 years as the stated clerk of John Knox Presbytery; seven years on the General Assembly’s Advisory Committee on the Constitution; and 17 years teaching Presbyterian polity at the University of Dubuque Theological Seminary.